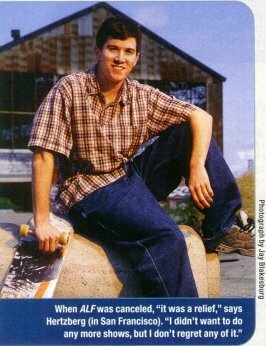 This article was taken from People Magazine article published on June 26th 2000. Part anteater, part Henry Youngman, ALF (short for Alien Life Form) dropped in on a suburban family and stayed, commenting snidely on Earth life while developing a taste for cigars, beer cans and slang ("Gimme four!"). "When we did the pilot, I thought, 'This can never possibly go.' Then it did", says Max Wright (top, clickwise from top right, Anne Schedeen, Andrea Elson, ALF and Ben Hertzberg). The Top 10 novelty hit inspired a marketing explosion bigger than the bang than the bang that destroyed ALF's planet, Melmac. "At first the network was nervous", says ALF's creator, Paul Fusco. They shouldn't have been. TV star ALF was soon sitting pretty on Hollywood Squares. ALF came to life via sleight of hand, but maneuvering the garrulous puppet created by magacian Paul Fusco was not the sleightest bit easy. "It was a great deal of work for everyone", says Fusco, 47, one of three people needed to operate the 4'3" ALF figure from beneath a specially built soundstage constructed 4 ft. off the ground. The set was marked with strategically placed hand holes that had to be hidden, and actors bravely traded dialogue with a tattered rehearsal version of ALF nicknamed Ralph. The cast routinely worked 18-hour days. "In order to preserve the illusion, it had to take that time," says ALF's human foil, Max Wright. Because of the problematic puppetry and the creature's alien identity, "ALF could never go out," says Fusco. "It got tough to do stories where he could only interact with the five or six people he knew." The series fizzled out in 1990 with a cliffhanger finale that left viewers wondering what had happened to ALF. A 1996 TV movie, Project: ALF, filled in some blanks: After abducting him from the Tanner home, the government installed ALF in a palatial suite on a secure Army base. Fusco, who lives in L.A. with his wife, Linda, 46, and son Christopher, 7, would like to bring the puppet back to TV. "ALF is hoping someone will come across with a nice offer," he says. Paul Fusco, the voice of ALF, won't say where he keeps his creation, although he produced the puppet for a People shoot at his home in L.A. Says Fusco, "That would be a terrible thing, to tell the fans that he's in a box somewhere!" "ALF was funny and full of invention. His movement was so expressive that once I actually could see the puppet blush," says Max Wright. But the former theater actor despised his role as supporting player to an inanimate object - especially one that came with enormous technical demands and hogged most of the good lines. "It was hard work and very grim," says Wright, 56. 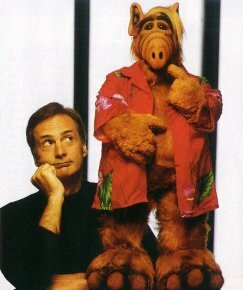 "Max had a difficult thing to do, playing straight man against ALF," admits the show's creator, Paul Fusco. "But there was great chemistry between Max's character and ALF." By the end of the series' four-year hitch, "I was hugely eager to have it over with," Wright acknowledges. On the last night of filming, "there was one take, and Max walked off the set, went to his dressing room, got his bags, went to his car and disappeared," recalls his costar Anne Schedeen. "Nobody had to say, 'Wrap,' and there were no goodbyes." What followed for Wright was a slump both professional - "I quit of couple of jobs, got fired from a job," he says - and personal. In 1995 he was diagnosed with lymphoma. "It was very scary. I was sort of numb about it," says Wright, who underwent chemotherapy and radiation and says that he has been cancer-free for five years. After treatment, he appeared in the movie Grumier Old Men and then worked in the theater. "It was electrifying," Wright recalls. "I came back to life after being on the edge, with a tremendous gusto for the things I love." Back on TV as the beleaguered head of the social-services acengy on ABC's Norm, Wright lives in Hermosa Beach, with his wife of 35 years, Linda, 59, and son Ben, 25 (they also have a daughter, Daisy, 31). The actor has revised his opinion of ALF. "It doesn't matter what I felt or what the days were like," Wright says now. "ALF brought people a lot of joy. They adored it." For Ben Hertzberg, known as Benji Gregory (his middle name) during his four years as ALF's youngest cast member, the enormous warehous where the show filmed was a romper room. "The only times it felt like work was when the lights were on and it was real hot," says Hertzberg, who remembers "climbing under the stage and messing around with the staff." He also made friends with TV sister Andrea Elson, who says, "He was just a normal kid - he wanted to get home to go skateboarding." Hertzberg, who made his showbiz debut at 13 months on Fantasy Island, had no interest in sustaining a TV career after ALF ended. "I was on a lot of stupid cartoons," he says. "Voice-overs are easy, and I wasn't actively trying to act anymore." Now 22 and sharing a house with three roommates in San Francisco, Hertzberg is a sophomore film major at the Academy of Art College, where he met his girlfriend of seven months, Sarah Hall. Thanks to ALF, he says, "I can pay my rent easily - most of the money is still in the bank - and I never get butterflies in my stomach when I have to talk in front of the class." But it's not enough to lure him back in front of the camera. "I'd like to work in the entertainment industry, but I'm not sure as what," he says. "Definitely not acting." The best thing that happened to Andrea Elson on the set of ALF was that she met her future husband. Scott Hopper, now 34, was a production assistant, "and he'd deliver my scripts," says Elson, 31, who played the Tanners' teenage daughter. "I was so smitten!" 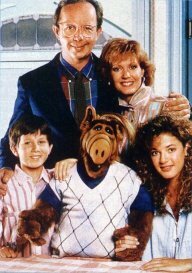 Although executive producer Paul Fusco remembers her as "always ebullient," some of Elson's memories of ALF are bleak. There was "tension on the set," she says, because the cast "had to play second fiddle to a puppet. It was ALF and then there was the little family." By the second season, Elson had also developed bulimia. "I was this skinny little twig when I started, and then I started to get breasts and hips and I didn't like it," she says. "I just wanted to be stick skinny." When the show went off the air, she says, "I was at the gym five days a week, two hours on the treadmill. I was obsessed." Finally, Hopper, whom she wed in 1993, confronted her. She didn't seek professional help but says, "I became healthy when I was pregnant in 1997." Six weeks after daughter Claire was born, Elson reported for a two-day job on The Young And The Restless. "There I was with the nanny and the kid and the breast pump," she says. "I realized, 'I'm not ready for this!'" With a lifestyle show in development, Elson thinks she may be now. "I needed to step away," she says. "But at last I've found myself." To hear Anne Schedeen tell it, fun with ALF was an alien concept. "Believe me, there was no joy on the set", says Schedeen, now 51. The stress level ran high, partly because "it was a technical nightmare - extremely slow, hot and tedious," she explains. 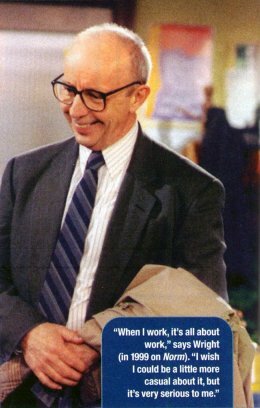 "If you had a scene with ALF, it took centuries. A 30-minute show took 20, 25 hours to shoot." Nonetheless, says the show's creator, Paul Fusco, Schedeen was "very professional. If she didn't enjoy her interaction with ALF, she was a good actress." And good company to her TV daughter Andrea Elson. "I was always in her dressing room," says Elson. "I thought of her like an aunt." Altough Schedeen was fond of her screen kids, she says some of the adults had "difficult personalities. The whole thing was a big dysfunctional family." Her own family provided respite. 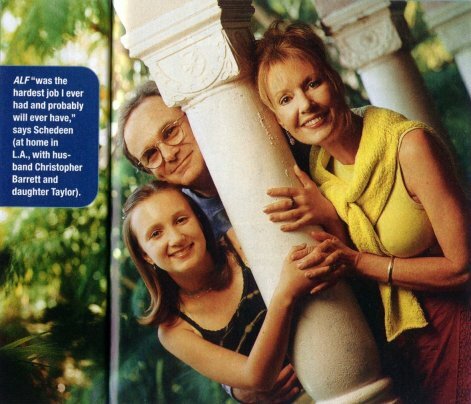 In 1984, Schedeen married actor Christopher Barrett, 51, now the owner of a talent agency, and in 1989 gave birth to daughter Taylor. The antiquer and fleamarket fanatic coaches comedy actors part-time and lends decorating advice to friends such as George Clooney. "It's astonishing to me," says Schedeen, "that ALF really was wonderful and that word never got out what a mess our set really was." Disclamer: The copyright of the text and all these pictures above is owned by the respective companies. I don't want to infringe on the rights of the any company who owns in the copyrights in your respective country.